As France celebrated the 30th anniversary of the Louvre's famous glass pyramid on Friday, French artist JR unveiled a giant collage intended to reveal its secrets. The iconic pyramid now appears to emerge from the abyss in an optical illusion created with huge strips of printed papers. Some 400 volunteers, working in teams of 50, spent four days pasting 2,000 paper strips on the cobbles of the famous museum's courtyard. 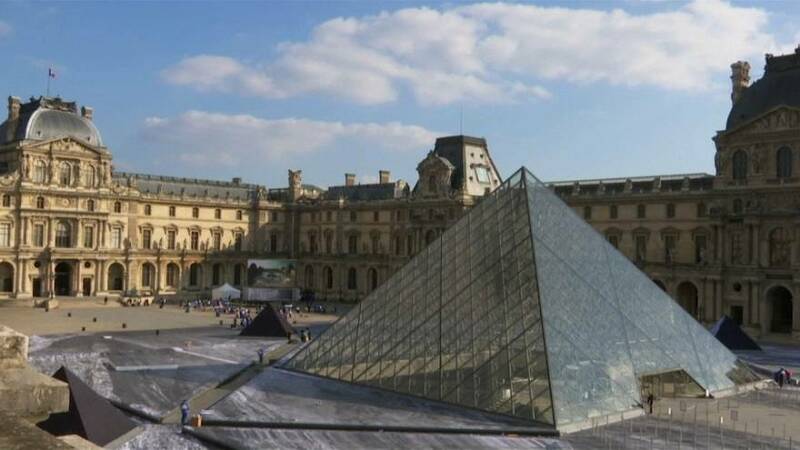 A camera on the roof of the Louvre fed images to two giant screens which appeared to show the pyramid emerging from its foundations, as if from a giant quarry of white rock. French artist JR has often been dubbed as 'the French Banksy' after the British street artist. He previously collaborated with the Louvre museum to camouflage the 70-foot-high pyramid in 2016. "Why not reinvent and rethink places? Why not wake up in your own city and allow yourself to reinvent and rethink it, to look at it in a different way?" JR said as the public discovered his new creation. The first visitors on Saturday seemed to appreciate the _trompe-l'oeil _installation. "It's in a dip, you could say. I didn't realise it was a way of erecting the pyramid from the ground, and that's interesting," said psychologist Odile Vurmes. "I know JR's work, not all of it, but I think he's really making a statement by doing this at the Louvre," pharmacist Charlotte Rayssac said. The Louvre's pyramid was commissioned by President Francois Mitterand to Chinese-American architect I. M. Pei's. While many Parisians hated its unconventional architecture when it was first unveiled 30 years ago, the pyramid is now revered like one of the Louvre's greatest treasures. Visitors have until April 1 to discover "the Secret of the Great Pyramid."